« When words matter in your career – Survey Says! We’ve all done advances. From single-site visits to multiple-venue, multiple-day movements. We meet with building managers, security directors and personal assistants. Once that’s over, the meetings are complete and the advance checklists are finished we’re good right. I don’t think so… A group that far too often gets overlooked in the day-to-day grind of advance work can make your life as a protection specialist very difficult if not handled properly. Yep, you got it. These hard-working men and women who most people don’t give a second thought to as they are moving vehicles or handling luggage in sub-degree weather can make or break a successful EP assignment. I‘ve seen the fruits of fortifying such relationships first-hand. I had a detail in Chicago with multiple site visits that happened to coincide with a huge victory parade, a Cubs vs. White Sox game, multiple street closings due to a movie shoot and Friday rush hour. Restaurant, hotel and vehicle traffic was going to be chaos! 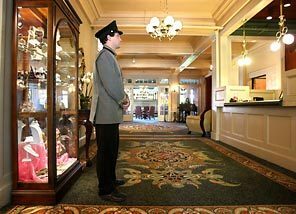 Having been aware of this prior, I made a point to visit the bellmen, valet and/or concierge at each venue after my official advance work was complete. I politely introduced myself, engaged in a little small talk and concisely explained my requests for each site. You’d be surprised what a firm handshake, a challenge coin and genuine respect for the hard work they do will get you. Three days later as we pulled up to our first venue, I made eye contact with said bellmen and he waived our motorcade right up to the pre-determined space I had politely requested. I was able to get my client into the venue safe and secure with minimum exposure. As we walked into the site, a valet shouted to my bellman our driver must move the vehicle NOW. My guy quickly replied, “They are official, they can stage there as long as they need.” I’m guessing his newly obtained cool guy challenge coin gave him the impression we were more “official” than what a private sector protection detail is. I surely wasn’t going to ruin his day or mine by spoiling his perception, he was free to think what he wished and my client was safe and our motorcade staged. I experienced similar success at each stop we made. Our detail went smooth, our client safe and happy. Total cost: A few challenge coins, about $50 in tips and mutual respect. Client Satisfaction: Priceless! Had I not taken that additional time to meet them, it could have ruined a detail or career. Bottom line; don’t forget the “ground pounders”. Make them a part of your advance. The great ones know every inch of their venue, the comings and goings, the clientele; the events. They’ve even been known to bank six figures!! Show em a little love; it could be the difference between that prime real estate at the front of the venue or parking garage Siberia! Thanks for that reminder. Contacting the men and women doing the work, leading from the front is essential. The challenge coin is an excellent idea. I will have to get some. I look forward to reading more from Josh Lee and as always look forward to your blog updates.